A cheesy quiche with all of the flavours of jalapeno poppers including cheddar cheese, cream cheese, jalapenos and a crispy crust! Jalapeño poppers have to be one of my favourite snacks and I am pretty addicted to them. Recently I have been experimenting with using the signature jalapeño popper flavours in other dishes with great success. Not too long ago I tried a jalapeño popper dip that was even more addictive than the original and the jalapeño popper grilled cheese sandwich quickly made its way to the top of my list no too long after. When I came across the idea of a jalapeño quiche on Hilah Cooking it immediately reminded me of the flavours of jalapeño poppers. 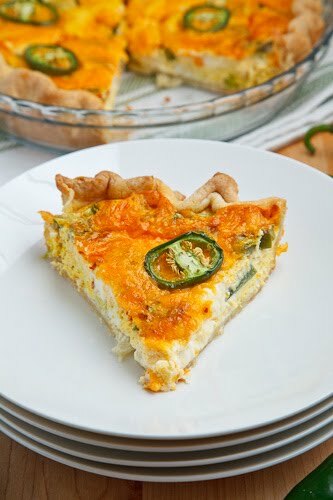 This quiche starts out with a layer of cream cheese that is topped with fresh jalapeño peppers, a creamy egg mixture and finally a layer of melted cheddar cheese. The whole thing is baked in an all butter crust that gets nice and crispy by the time it is done. I was completely taken with the idea of being able to have jalapeño poppers for breakfast in quiche form and I just had to make it! This quiche is pretty easy to make, though making your own pie crust can be a bit tricky. The one thing that you are going to want to be careful about with this recipe is the heat provided by the jalapeño peppers. If you are not the biggest fan of heat you will want to seed the jalapeño peppers and maybe even cut back to one. If you are a fan of heat you can leave the seeds in like I did and maybe even add an extra pepper. 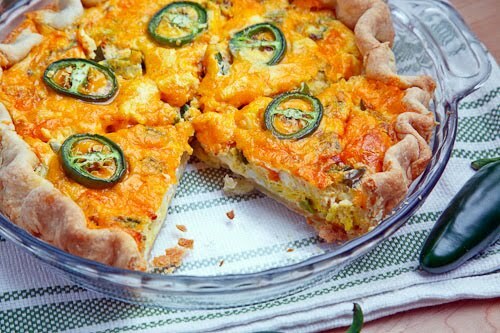 I have to say that this jalapeño popper quiche was really amazing! It is hard to beat a hot, spicy and cheesy quiche for breakfast and with this one I was certainly looking forward to breakfasts this week! 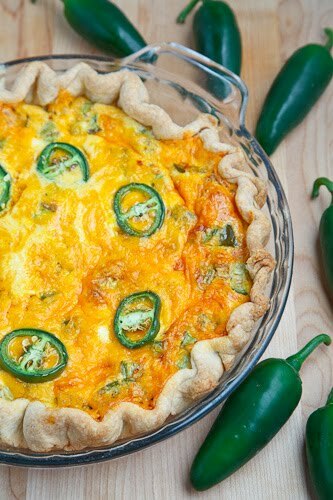 Spread the cream cheese over the bottom of the pie crust and sprinkle on the diced jalapenos. Heat the milk and cream over medium heat until just before it boils, about 5 minutes and pour it into a large bowl. Pour the eggs into the heated cream while stirring constantly. Mix in the paprika and salt. Pour the mixture into the pie plate and bake in a preheated 350F/180C oven for 30 minutes. Remove from oven, arrange the jalapeno slices on top, sprinkle with cheese and bake until the cheese has melted and turned golden brown, about 15 minutes. saw this in a grilled cheese form and now a quiche. need to make this for breakfast this weekend. Oh.My.God… This looks amazing!! I am in love with jalapeno poppers too! I am excited to check out the dip and grilled cheese sandwich. =) Thanks for sharing! I'm bookmarking this right now! I can't wait to make it for my son! My boyfriend would love this…printing it out now! Wow,it must be absolutely delicious & it looks so beautiful! Mmm cheesy AND spicy. What more could you ask for in a quiche? Best idea ever??? I THINK SO!!!! Do you think I would be able to make this ahead of time and freeze it? I would like to bring it to a get-away weekend and reheat it for Sunday brunch. This reminds me of the really delicious chile relleno I had last night – oozing with creamy cheese and cornmeal-crusted, yum! I have never made quiche before and I should try it finally. I just stumbled across your blog and am loving your recipes. I just received 10lbs of feta that needs to be used up, this salad looks a perfect use for it! Jalapeno popper mac & cheese is made of awesome as well! I just added this to my "must make" list. It looks divine. I want to do this but bake it in my Big Green Egg and add bacon. Just made this. I made it into mini quiche using muffin tins. Got 12 medium size quiche using exact same amounts in recipe. Thanks so much. Really delicious!! My husband and my 3year old (made her's with seeded jalapenos) like it. Great idea! Love jalapeno poppers, as well, but I've never made them. Must.change.that.now! Jalapeno poppers were what I thought of, too, when I first tasted this quiche. It's so good! Thanks for spreading the word. Carrie: You can make this quiche ahead of time and then freeze it either before or after baking. If you freeze before baking, place it in the oven frozen and bake for an extra 10-20 minutes. If you freeze after baking you can heat it in the oven, from frozen, for about 20-30 minutes. Foodycat: Jalapeno popper mac n cheese is a great idea! Wow, this looks delicious. I can't wait to show my daughter. For your (or mine) next challenge "Popper Scalloped Potatoes" complete with the bacon on top! Oh my….that would make for a spunky holiday. Penny Wolf: I definitely have the Popper Scalloped Potatoes on my list to try! It will take scalloped potatoes to a whole new level! Finally made this tonight and it was fabulous! It will definitely be a part of our regular meals! Gonna try to make this low carb without the crust … maybe use riced cauliflower and egg for the crust instead. LOVE Jalapeno poppers! Hi again… nope an actual rice crust would be too high in carbs. I meant using cauliflower and 'ricing' it like can be done for mashed potatoes. Thanks for trying but I WILL definitely make this work, it is too yummy to pass up. fabricpixie: I will have to look into a cauliflower crust for a quiche. I have seen cauliflower used as a crust for pizza and wanted to try it. This quiche is awesome. Next time my husband wants to try adding bacon. Can't wait to try a few more of your recipes. Thanks for sharing. Wow! Made this for breakfast today, Cinco de Mayo 2013. I made a slight change, which may have added to the cooking time. I cooked up some Jimmy Dean sausage (regular), when is was almost done, I tossed in the diced jalapeno. I mixed it with the cream cheese to help make it spreadable. I then spread this along the bottom and the sides (as thin as possible). Baked per directions, but it took about 15 minutes longer for the egg section to reveal a clean toothpick. Other than that, it was a great dish. I made two at the same time and served them for breakfast at the church youth group. Its a hit! Thanks for the receipe.